Lots of people say squirrels are pests. That's because squirrels often eat the birdseed that people put out for birds. Squirrels can also damage porches and houses by chewing or digging into them. But squirrels are smart, athletic, and funny. They leap between branches, run across wires, climb poles, do somersaults, wrestle each other, and invent new ways to get what they want. 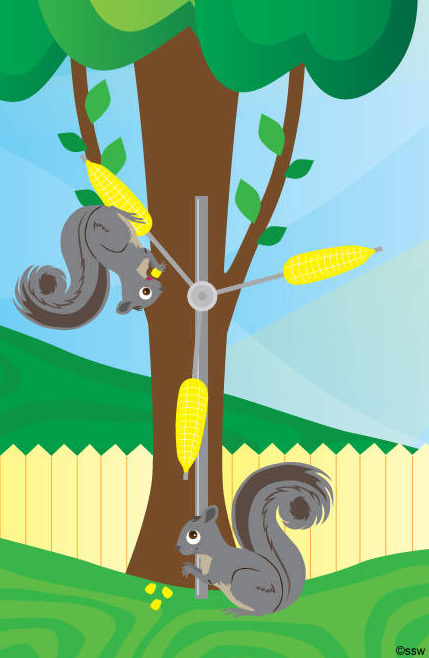 If you feed squirrels, they might stay away from the bird food and your house. Or they may wait till you're not watching and then make trouble! You can buy squirrel feeders at garden stores, or you can build your own. Some designs require a grownup's help. But here are ideas for feeders you can make yourself. Get some dried corn-on-the-cob at a store that sells garden supplies. Get a piece of heavy string. Tie one end of the string to the cob. 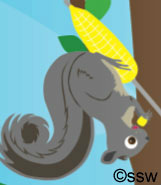 Tie the other end of the string to a tree branch or bush, so the cob dangles in the air. Find a pine cone or a bumpy stick. Get a piece of heavy string. Tie one end of the string onto the pine cone or stick. Smear peanut butter onto the pine cone or stick. Press birdseed into the peanut butter (or roll the cone or stick in a bowl filled with birdseed). Tie the other end of the string to a tree branch or bush, so the pine cone or stick dangles in the air. Get a piece of flexible wire. Get some toasted-oat, circle-shaped cereal, like Cheerios®. Push the wire carefully through the holes of the cereal. Keep doing this till you have a long line of cereal on the wire. If you want, you can push small pieces of fruit onto the wire, too. Bend the wire into a circle. Hook the wire circle around a tree branch or bush. Or just put some birdseed or fruit in an unbreakable bowl, and set the bowl on a table outside. Once the squirrels find the food, they'll eat it fast. Have fun watching them!